Well, I thought I would share another casserole. I was out of town all last week for my spring break. I enjoyed a week in TEXAS seeing all three of our girls - it was fabulous! Chris was home all week so I thought I would make him another yummy casserole since he had requested something with crunch, texture, fat, etc. 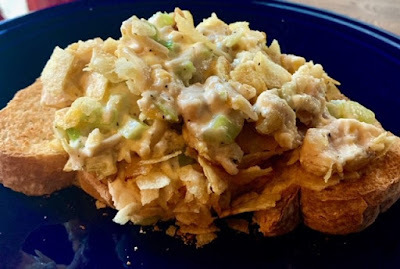 I was looking through my old recipes and found this recipe for Hot Chicken Salad. I was mixing it up the night before I was headed out of town and Chris noticed and asked me, "is there a starch in that recipe?" Well.... no! The Tuna Casserole I posted a few weeks ago had pasta and I think Chris was hoping for a good chicken and rice casserole. I will make that sometime soon. He enjoyed every bite of this yummy crunchy Hot Chicken Salad. I suggested he eat it over toast... or make rice on the side. He enjoyed it both ways since he ate it for like four nights in a row. Mix all ingredients except potato chips and spoon into a 8 x 8 square prepared pan. Top with crushed potato chips. Bake uncovered at 375 for 20 minutes or until bubbly and slightly browned. Loaded Mini Bell Pepper Turkey "Nachos"